Raglan or Semi-Raglan - What’s the difference? As you know, a Carr & Westley collection contains many styles and designs of clothing. Through our product descriptions you will notice we regularly refer to specific features on items of clothing with strange terms, some common, some not so much, in the world of fashion. In our latest series of articles we’re going to help clarify some of these descriptions by delving into the more specific aspects of these cuts. We’ll explain exactly what they mean and show some examples to look out for. The first design feature we’re going to look at is the raglan and semi-ragan sleeve. The raglan sleeve was first designed and named after Field Marshal FitzRoy James Henry Somerset, 1st Baron Raglan. Raglan was a respected individual who fought and lost his arm at the battle of Waterloo. After losing his arm, a new coat design was commissioned to help accommodate his missing arm - one with fuller sleeves. The term raglan sleeve refers to the way a top’s sleeves are sown into the main shell of the garment. The more common style of sleeve is the ‘set-in’ sleeve, where the armhole of a garment is at the natural edge of the shoulder. With a raglan sleeve, however, the sleeve seam goes straight from the underarm to the neckline, running across the collarbone. The raglan sleeve design has proved popular with long sleeved jumpers and cardigans as it provides a very comfortable fit with easy movement - particularly in plus size clothing. A modification on the traditional raglan sleeve design is the semi-raglan sleeve. 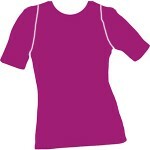 In this design, the armhole has curves setting in the mid of the shoulder seam. What makes a semi-raglan sleeve distinguishable is the slanting seam. The way in which the seam is placed makes it appear as if there is not a specific defining line of shoulder placement within the garment. There are many other variations of the raglan sleeve too. Popular examples include the saddle sleeve, gathered-raglan and raglan-yoke. Have a browse through the website and see which variations you can find. This entry was posted in Classic Clothing on May 26, 2015 by Harry Burton.